The Frequent Parker Card (FPC) is a 50% off discount card that may be used in both Downtown 5-story garages located near 4th/A and 4th/C St. The FPC is ideal for those who frequent Downtown, yet don't visit daily. The normal hourly rate in these garages is $1.00 p/hr. When you use the card, the rate you pay becomes $0.50 p/hr. The FPC costs $25 and is a ONE-TIME fee required to obtain the card. Stop by the Parking Services office (1033 C Street @ Fifth Ave.) to get started. No application is required. Meter bags and "No Parking" signs may be purchased at the Parking Services office at 1033 C St.
"No Parking" signs must be placed at the "no parking" location and verified with the Police Department at least 72 hours (3 days) prior to start of your "No Parking" request date. Are you moving or relocating? 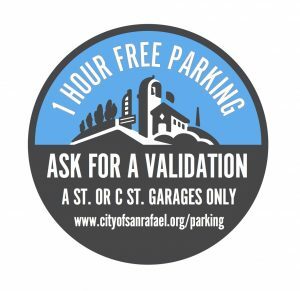 San Rafael does not currently have any residential areas with parking permits in place. If your neighborhood is interested, please take a look at the policy below and contact us. When placing signage on your private property for parking restrictions, refer to the guidelines here.